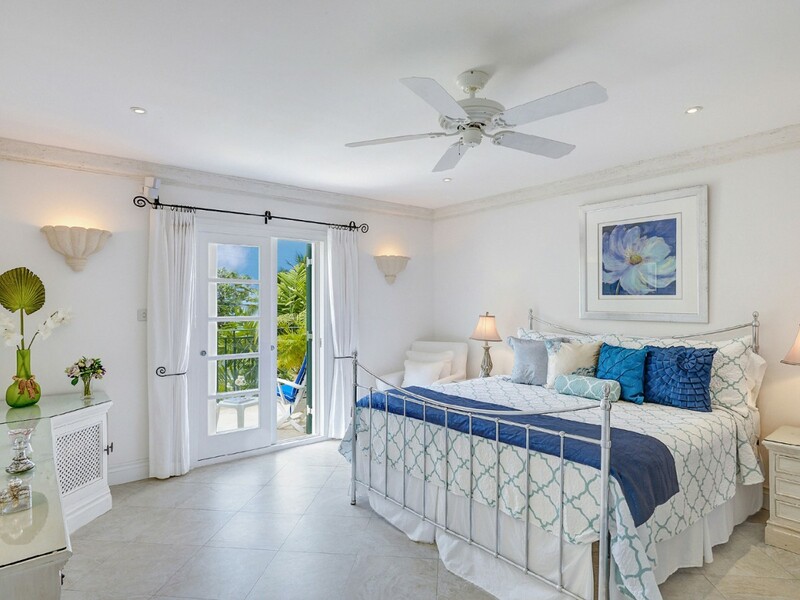 Part of the Mullins Bay Development, Villa Mullins Bay 6, Jasmine is a contemporary property with all of the classic charms of the Caribbean. A mature garden with all kinds of native trees and plants, a rooftop deck, and privacy among the gated community's many amenities add up to a real winner. 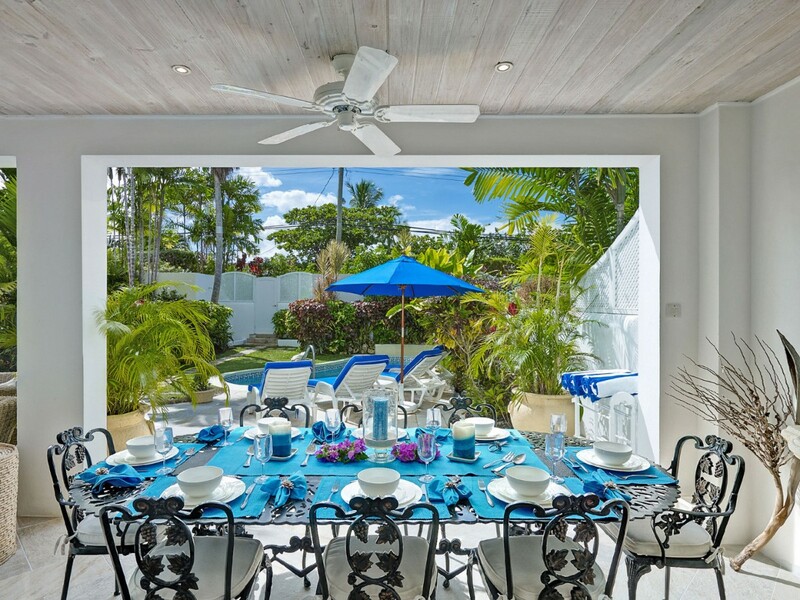 A three-bedroom property, the three-story villa is an ideal option for a group of discerning travelers eager to discover the best of Barbados. As part of the community, visitors have beach membership via the Fairmont Royal Pavilion, giving them access to Mullins Beach, with the equally lovely Gibbs Bay Beach just a short walk along the shore. There are water sports at the beach along with a cheerful and popular restaurant and bar. Of course, the amenities of the villa may be a strong attraction that keeps you there for a majority of the time. After all, guests enjoy their private garden with a lovely private swimming pool and stone terrace. They have a veranda beneath which is an al fresco dining table and fully furnished lounge. Just in from the shaded verandah is the large and airy living room. Oversized sofas, high ceilings, and a pale palette instantly calm, and you can even watch late night movies here too. 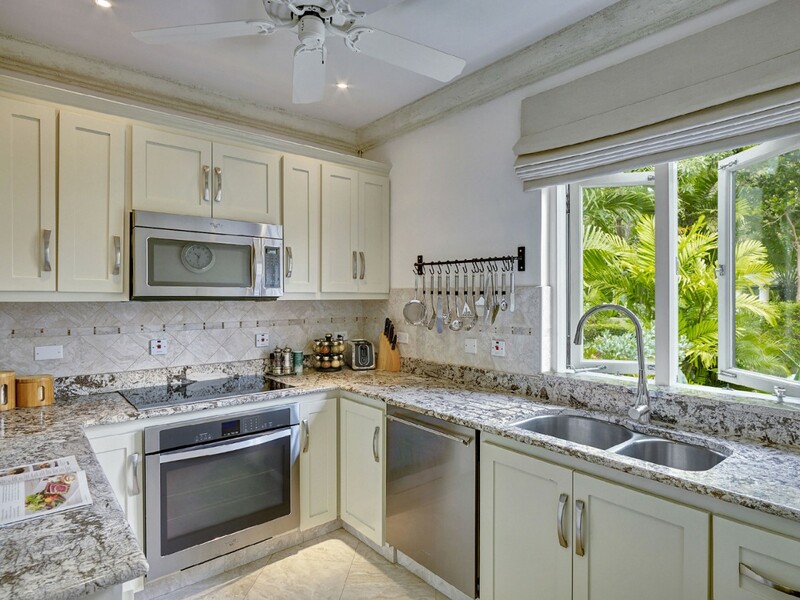 Your gourmet kitchen allows you to make meals of all kinds or whip up beverages and snacks in style and ease, and the bedrooms are also great retreats too. 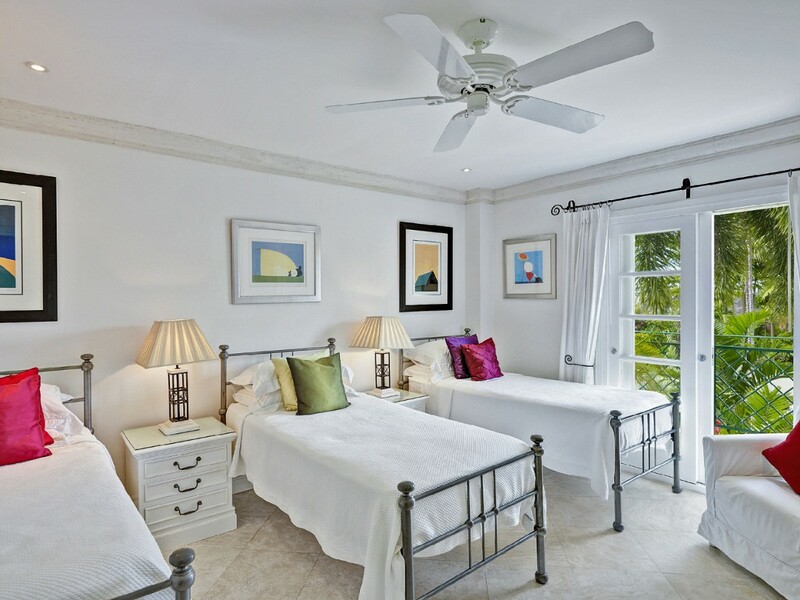 Spread out between the ground and second floors, they feature king beds and large en suite bathrooms. The master bedroom opens to the terrace area. There is also the charming rooftop hideaway, ideal for sunbathing or stargazing. 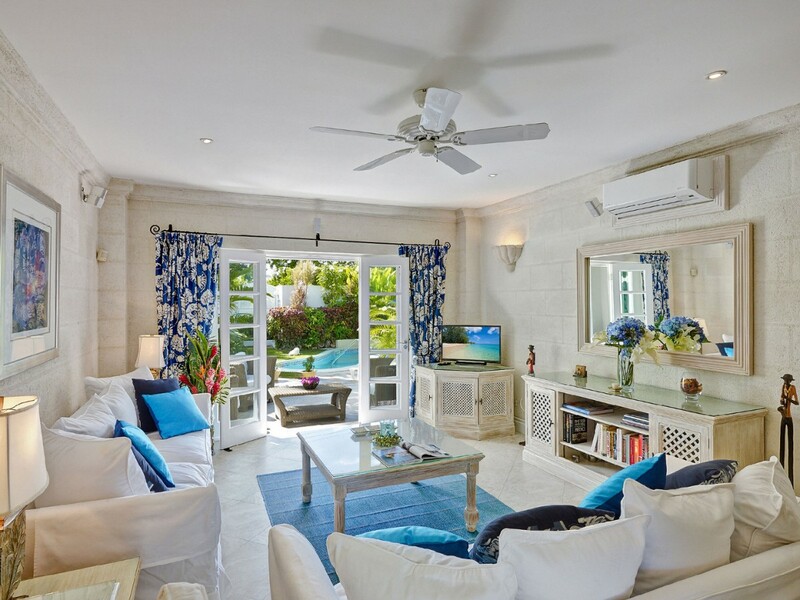 Steps from the beach but a perfect paradise on its own, Villa Mullins Bay 6, Jasmine is a wonderful find and sure to create the ideal setting for your next Barbados holiday. Bedroom 1: First floor Master bedroom with a king-size bed, A/C, ceiling fan, access to terrace and en-suite bathroom with bathtub, shower, vanity and WC. 2 guests maximum. Bedroom 2: First floor bedroom with 3 single beds, A/C, ceiling fan, access to terrace and en-suite bathroom with bathtub, shower, vanity and WC. 2 guests maximum. Bedroom 3: Ground floor bedroom with a king-size bed, A/C, ceiling fan and en-suite bathroom with shower, vanity and WC. 2 guests maximum. Cannot rate this town house high enough, everything you could ever want is there, It is by the sea just across the road, lovely walks along the beach for miles. Beach bar opposite as well only stays open late on a Sunday not open for dinner the rest of the week so quiet in the evenings. We will visit again. This was our second stay at Jasmine, Mullins Bay and it was everything we remembered it to be from 2 years ago - and so much more. 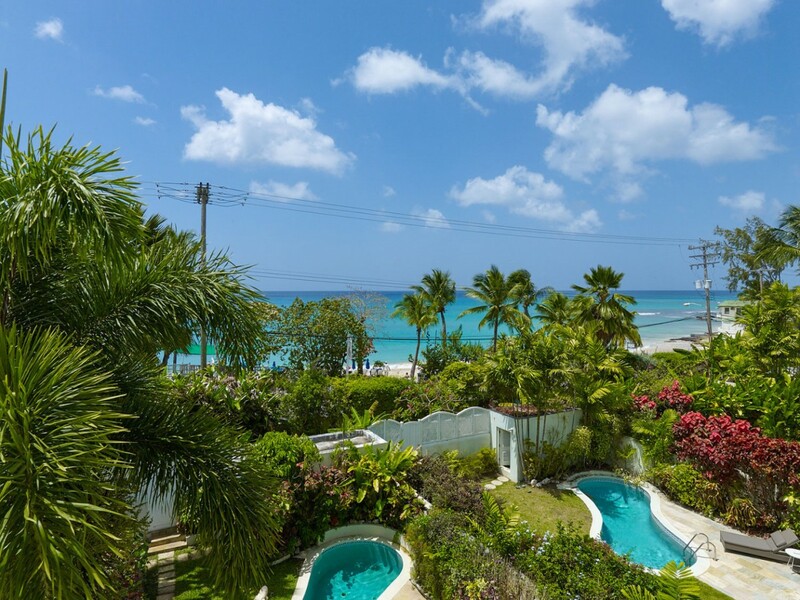 It has everything you would ever need - lovely spaces, great views, privacy and security and yet the amazing Mullins Beach and it's fantastic bar/restaurant only a stones throw away. The option of a quick dip in the villa's own pool or longer swim in the communal pool (with waterfall and cave) was great for the kids. The superb air con throughout keeps the inside temperature pleasant and if you wanted to cook rather than go out, Jasmine also has all you would ever need including a BBQ to grill that freshly caught fish. The roof terrace is a great spot for a sunbathe during the day or a pre dinner drink during the evening and the decor throughout is fresh and light and in keeping with the local style. There is a 24hr shop 2 mins away and a number of restaurants either a short walk or short drive. The piece de resistance however, has to be the amazing house maid Rosie. She leaves no stone unturned and nothing is too much to make sure your holiday goes like clock work. From cleaning and washing to cooking and baby sitting - she ensures you maximise your time doing the fun things. We're already trying to decide when our 3rd trip here will be and if you're thinking about coming to Jasmine - I would implore you to do it. You will be blown away. This was our second stay at Jasmine, Mullins Bay and it was everything we remembered it to be from 2 years ago - and so much more. 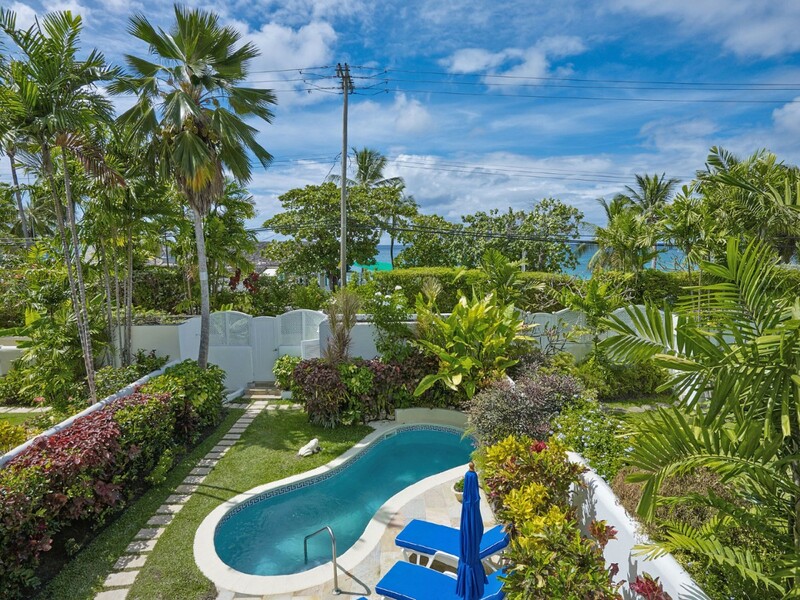 It has everything you would ever need - lovely spaces, great views, privacy and security and yet the amazing Mullins Beach and it's fantastic bar/restaurant only a stones throw away. The option of a quick dip in the villa's own pool or longer swim in the communal pool (with waterfall and cave) was great for the kids. The superb air con throughout keeps the inside temperature pleasant and if you wanted to cook rather than go out, Jasmine also has all you would ever need including a BBQ to grill that freshly caught fish. The roof terrace is a great spot for a sunbathe during the day or a pre dinner drink during the evening and the decor throughout is fresh and light and in keeping with the local style. There is a 24hr shop 2 mins away and a number of restaurants either a short walk or short drive. The piece de resistance however, has to be the amazing house maid Rosie. She leaves no stone unturned and nothing is too much to make sure your holiday goes like clock work. From cleaning and washing to cooking and baby sitting - she ensures you maximise your time doing the fun things. We're already trying to decide when our 3rd trip here will be and if you're thinking about coming to Jasmine - I would implore you to do it. You will be blown away. We just spent 9 days at Mullins Bay 6 Jasmine villa. 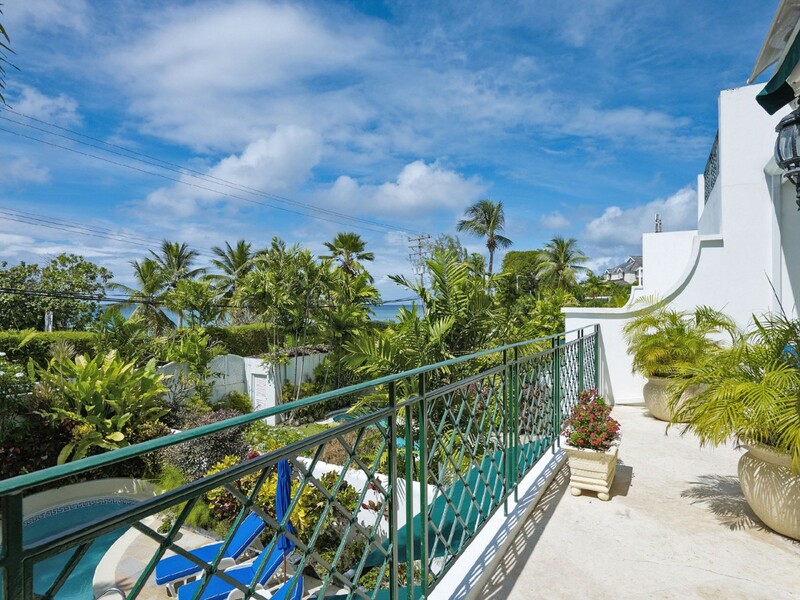 This is a 3-bedroom-3 bath villa that is beautifully decorated and maintained. It is well-stocked with any conceivable appliance, utensil and accomodation. The bedrooms are beautiful and each have their own lanai facing the water. The backyard is magnificently landscaped and has a private pool. The villa is just across the road from a great beach and the best beach bar in Mullins. But what made our stay special was the wonderful Rosie, our housekeeper. She came everyday to clean the villa, do our laundry, give us great ideas for dining and cooked us probably the best meal we had during our stay. She is the best ambassador for Barbados and became part of our family. Our decision to return to Barbados would have to include this same villa so we can again spend time with our dear Rosie. If there was any negative it would be that the free access beach was a 10 minute drive or crazy bus ride from the villa. You can go to the beach across the road and negotiate prices for chairs and umbrellas. But otherwise, this villa was beyond perfect. We shall return!! I loved everything about this villa. From the minute we arrived to the very last minutes before leaving- Had a blast. The housekeeper ROSIE is one of the greatest people I've met in my life. Between her and this amazing property... I have the best birthday ever. 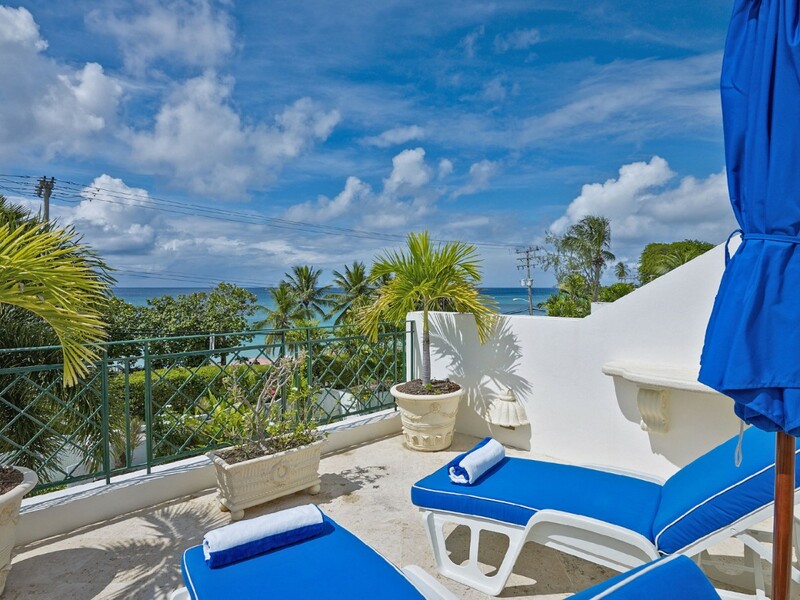 I am more than proud of my choice of where to stay for my "40"th birthday trip to the ever lovely island of Barbados. This villa has everything you want to enjoy this amazing island. Very clean and super comfortable. The pool in the back is so useful. The Mullins beach bar is across the street. The complex also has another larger pool with a grotto. A gas station in walking distance. 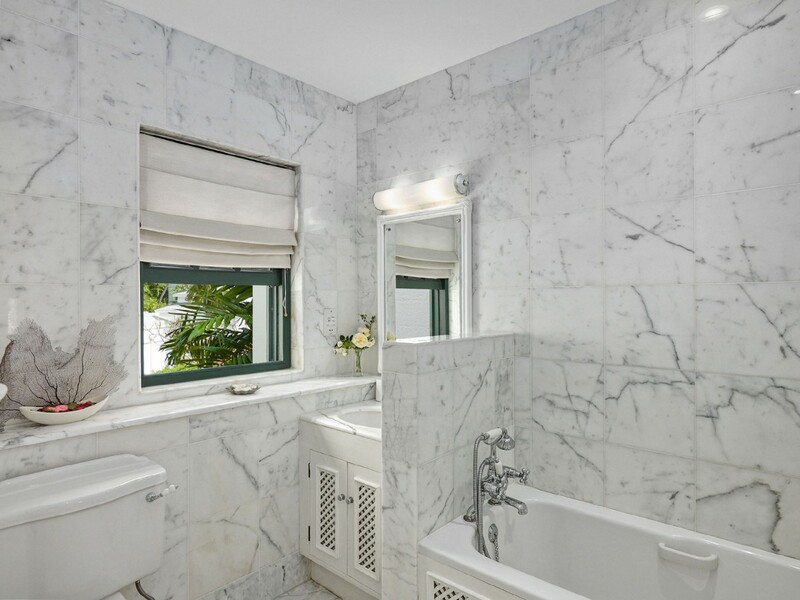 From the top levels, you can tan in privacy and see the entire ocean at Mullins beach across the street. Waking up here daily was such a treat. It was an absolute pleasure to stay here! Treat yourself as I did. STAY HERE!!! We highly recommend this very comfortable house. We have returned for another stay having been here earlier this year and previously a number of times. The accommodation is maintained to a very high standard and the housekeeper is wonderful. 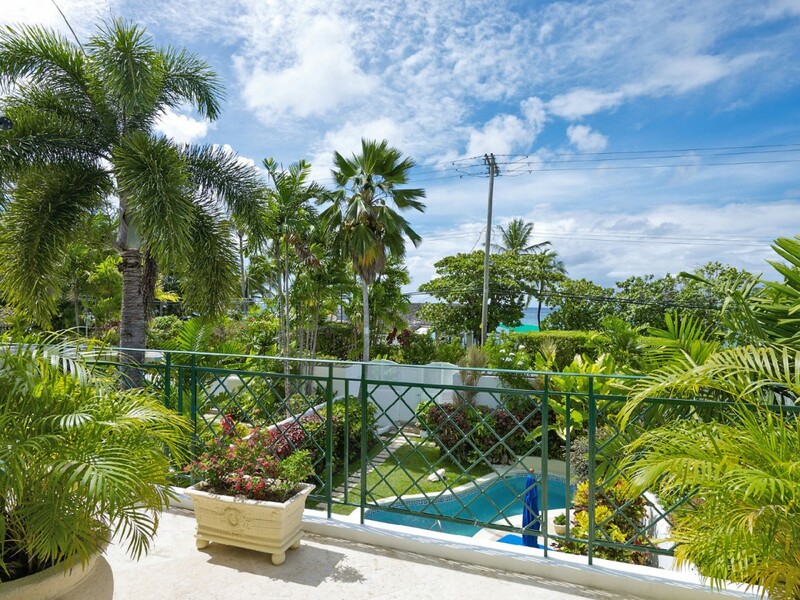 It is within very close walking distance of Mullins Beach (across what can be a busy road). The Mullins beach bar is close by offering good standard beach bar fare. Bombas restaurant is within easy walking distance with its high standard local menu. Cheers bar and grill offers basic fare suitable for families and is within easy walking distance. Speightstown is nearby (about a mile) with its local shops, bars and street market. The nearby filling station has a 24hr shop - good for emergency supplies of icecream and chocolate! Beware many restaurants etc close in September. 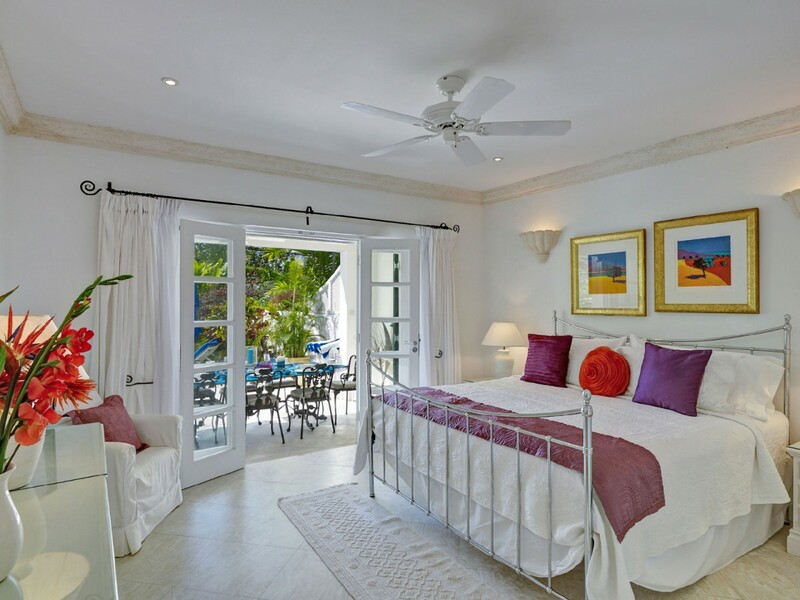 Two couples shared this property which was just as described and more, the housekeeper Rosie could not do enough for us, she cooked us a typical Bajan meal one evening which was delicious. Excellent position with Mullins Beach Bar right opposite us and local transport frequent. Long walks along the beach early morning were just lovely, the nearby restaurant Bombas was excellent and right on the beach. Cannot recommend this property enough so comfortable and relaxing. The villa was absolutely perfect. The interior was beautifully appointed, well furnished with every conceivable appliance and accessory. The backyard was a tropical paradise with a beautiful private pool. 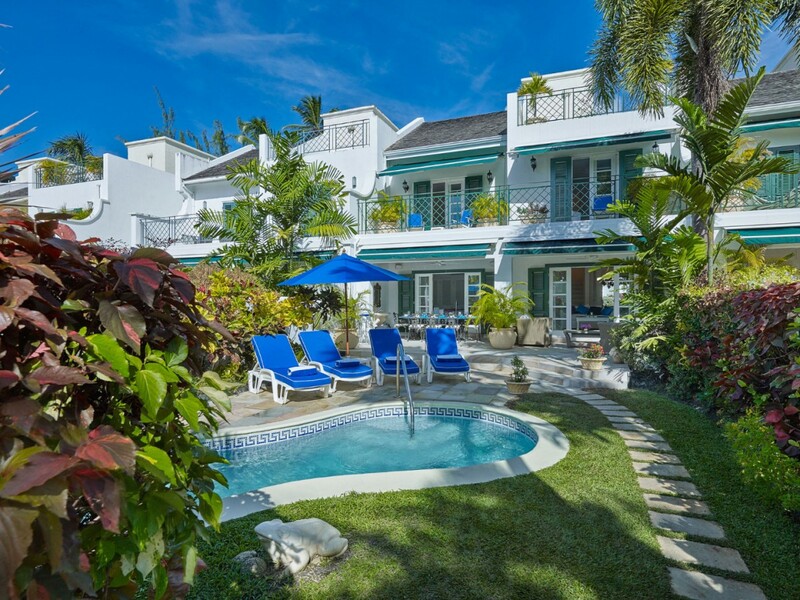 The villa is across the street from the best bar in Mullins bay and walking distance from some great restaurants and beaches. But the best thing about the villa was the housekeeper, Rosie who made our stay an absolute joy. She made us feel welcome, kept the villa spotless, cooked us a great meal and gave us some great recommendations for attractions and meals. She is a great ambassador for Barbados and Jasmine 6 ownership. The only negative comment would be that the free beach included with the villa was a 10 minute drive or death-defying bus trip. There is a great beach just across the street that we used and paid for chairs. The owners might consider offering this beach as part of the deal. 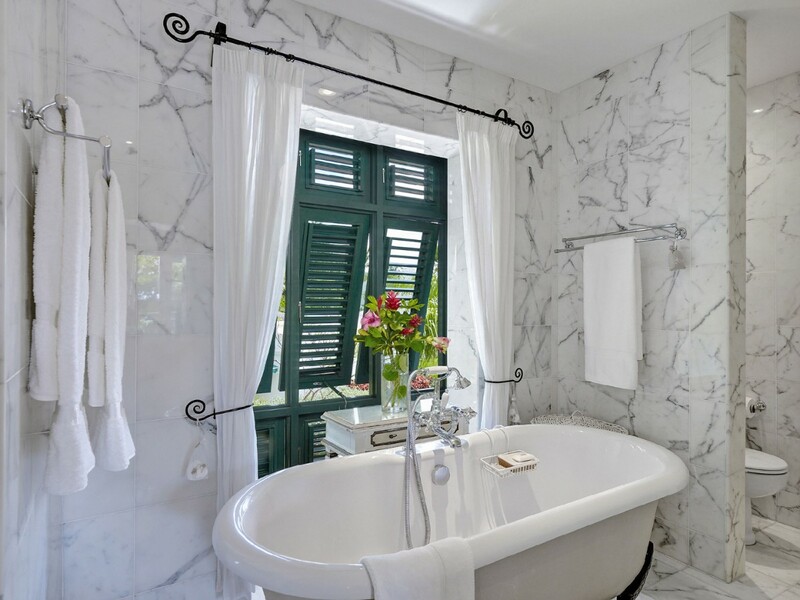 Short of this detail, our stay at Jasmine 6 was perfect. Isle Blue Services Comments: All of the services from Isle Blue were very good.